Take a close look at the boys in your ministry next weekend during worship time. You'll probably find many of them just standing there. Over the years, I've observed this in most churches. 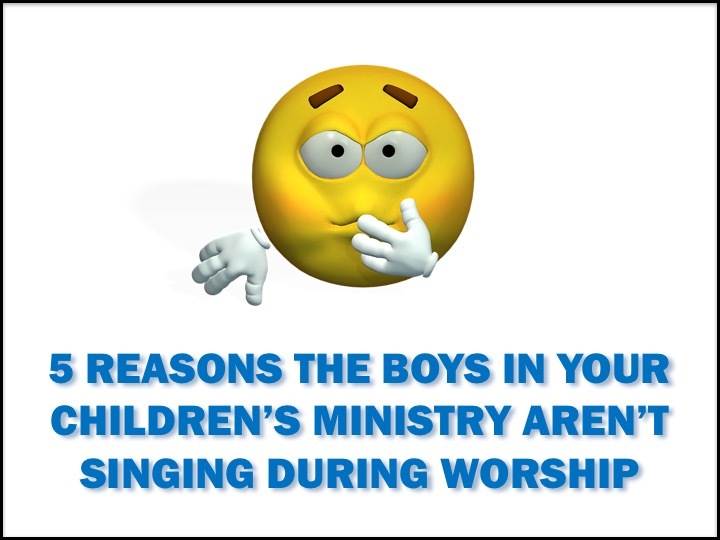 Many boys don't sing during the worship time. I've seen this happen in all size churches from mega churches to smaller, rural churches. Why is it boys don't sing during worship? Let's take a look at 5 reasons and how you can make changes to get more boys involved in worship. There are few, if any, males up front leading. In the elementary years, boys steer clear of anything that appears too "girlish." When they look up front and only see girls leading the worship, they put up a wall and refrain from singing. Many children's ministries work hard to get male role models in key areas like teachers, small group leaders, mentors, etc. but then neglect to place males in worship leading. And it shows in the boys who stand with their mouths closed during the songs. You can change this by making sure you place some males leading worship. And if you have a female leading, make sure you have some males front and center with her. You're doing too many motions. Motions have been used for years to help engage kids in the songs. But if you're not careful, you'll use too much of a good thing and see it become a hindrance to boys worshiping. When kids are more focused on trying to keep up with the motions than they are in singing to God, then changes need to be made. Use simple motions that are easy to follow. And less is more when it comes to motions. You want the focus to be on the words more than they motions. You're singing too many slow, emotional songs. Girls are naturally more emotional than boys. Boys are not going to engage as much in songs that are filled with slow, emotional lines. While it's important to sing songs that cause kids to slow down and reflect on the love of God, heart matters, devotion, etc. - it's also important to sing high energy, action-based songs if you want more boys to engage. The volunteers aren't singing. When volunteers are standing in the back of the room during worship, the kids notice. When volunteers aren't engaged, the kids won't be engaged. When volunteers aren't singing, fewer kids will be singing. Cast vision with your volunteers about leading by example during worship. Share with them how they have the opportunity to influence kids to be worshipers rather than spectators. And in reference to the first reason, place your male volunteers among the boys during worship. When the boys see the male leaders worshiping beside them, they will be more likely to begin worshiping themselves. They are insecure. This is especially true during the pre-teen years. Kids are trying to find their identity and are very insecure. They avoid any situation that might embarrass them or make them feel awkward in front of their peers. This includes worship. They are very conscious of their peers around them during worship. The person leading worship can help kids with this by taking a minute before the first song to address the elephant in the room and remind kids about the purpose of worship and that our focus should be on God and not each other. Your turn. Do you see fewer boys engaging in worship than girls? What do you do to encourage boys to worship? Share your thoughts with us in the comment section below.